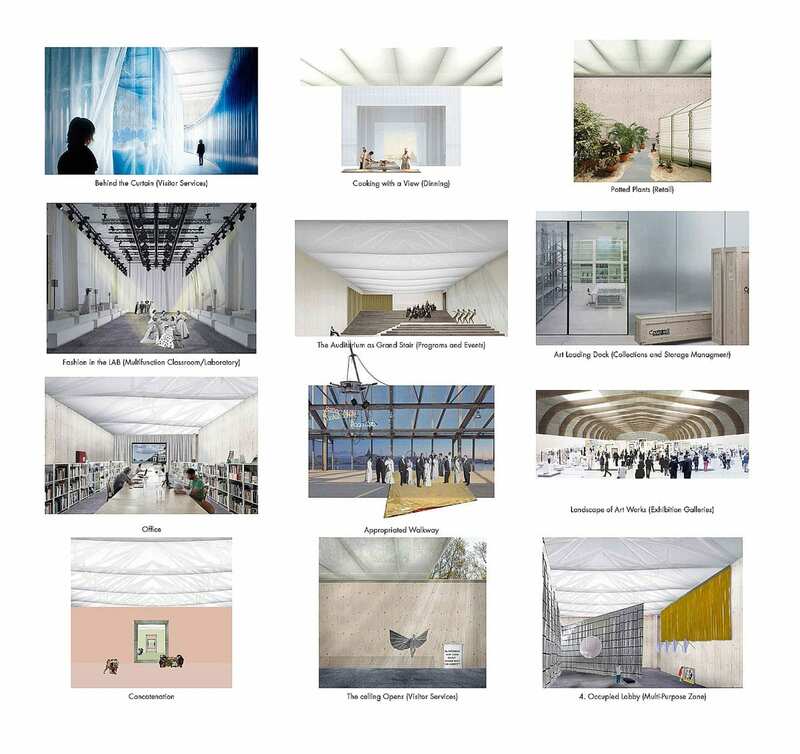 Staging a completely open, international competition for one of their museum projects marked a significant departure for the Guggenheim Foundation. 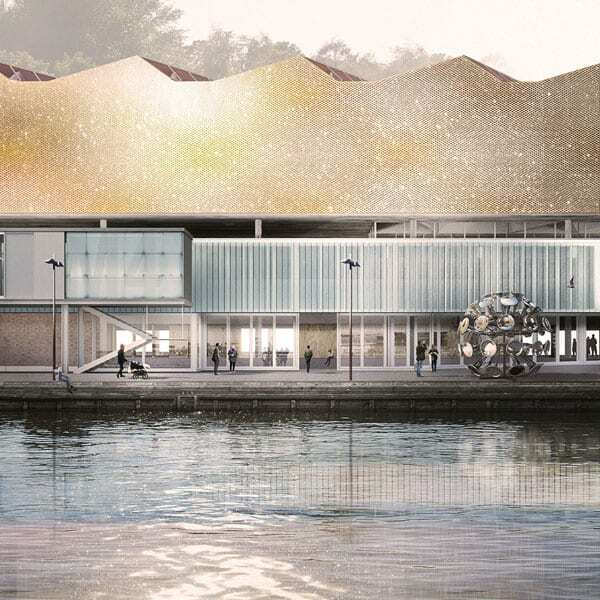 The Bilbao Museum had been an invited competition won by Frank Gehry, and the more recent Whitney Museum project in New York was a Renzo Piano commission. 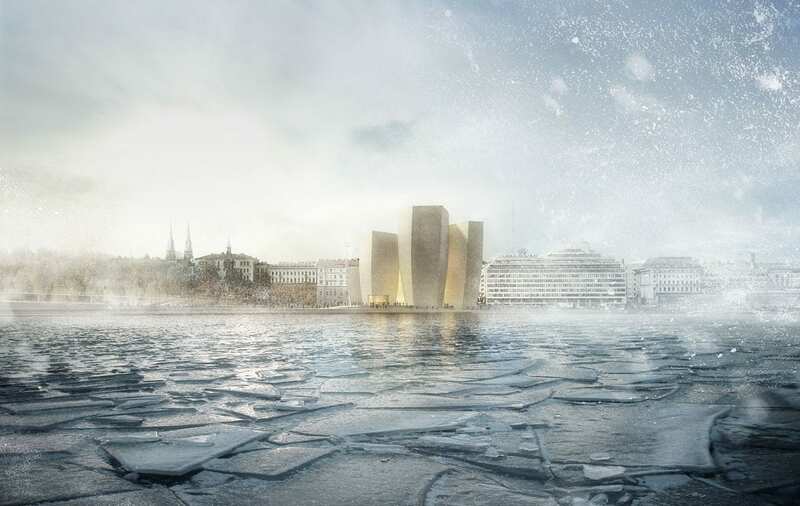 So the Helsinki Guggenheim project—though without any guarantee from the Finns that it will be built—was open to all comers, completely absent of shortlisting based on size of office or any history of built projects. 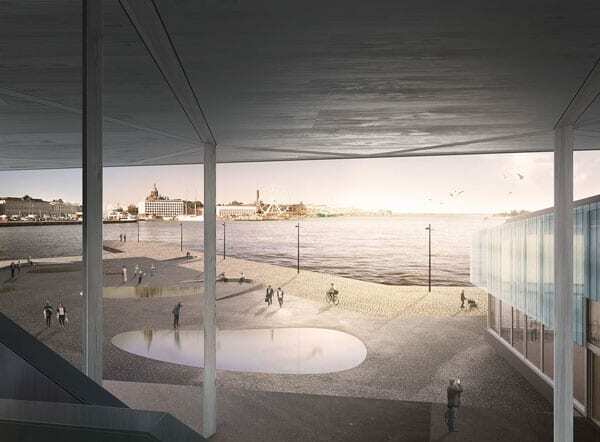 But this was Finland, and that Scandinavian country is known for opening up important projects to international competitors—the most recent Helsinki Library and Serlachius Museum competitions being prime examples. The soothing circular auditorium beneath the rotunda of Frank Lloyd Wright’s New York Guggenheim Museum was an unusually suitable setting for the revelation of the winning design for the proposed Helsinki Guggenheim and a discussion of the process that led to its selection. 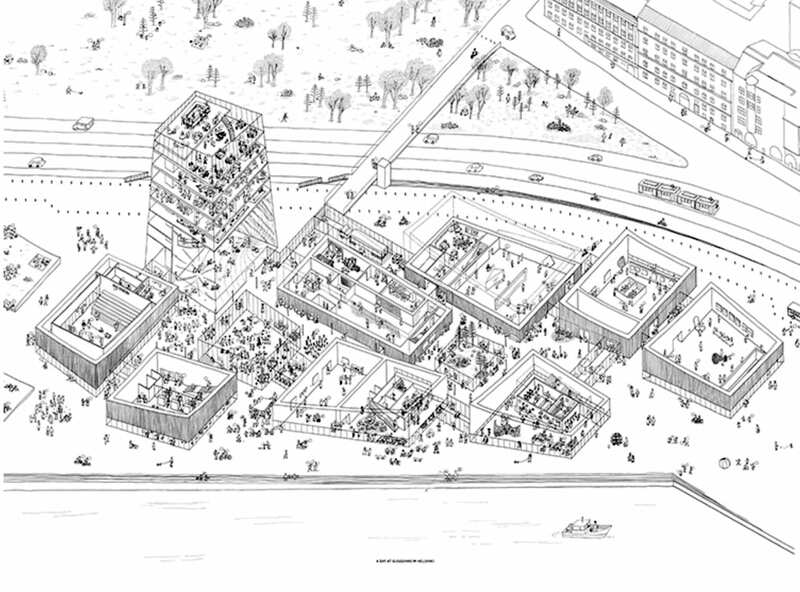 On July 1, the winners of the competition, Hiroko Kusunoki and Nicolas Moreau, of Moreau Kusunoki Architectes in Paris, took turns describing their scheme as they showed an impressive series of drawings and models. After their presentation, they joined a discussion, moderated by Architectural Record Editor Cathleen McGuigan, with Guggenheim staff members Ari Wiseman and Troy Conrad Therrien. 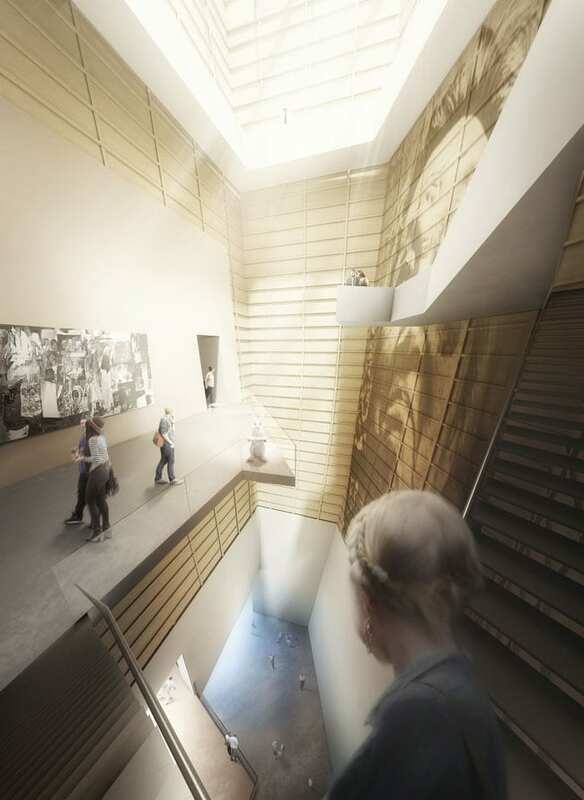 Wiseman, a Deputy Director of the Solomon R. Guggenheim Foundation, has shepherded the competition from the conception stage in 2013. 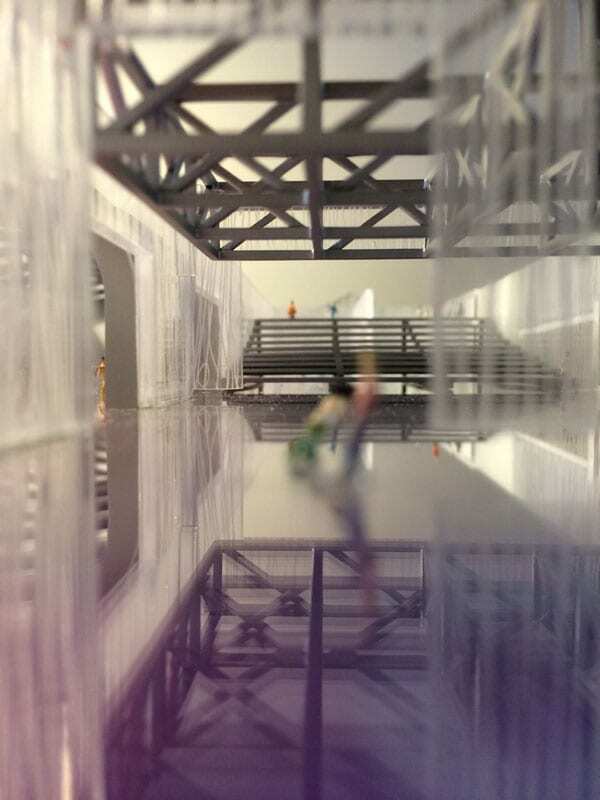 Therrien, the Curator of Architecture and Digital Initiatives, has created the state-of-the-art digital archive that has brought this competition and its entries into the public domain. Although their English was sometimes halting, Kusunoki and Moreau managed to explain the thinking process that brought their scheme into being with a charming combination of confidence and modesty. Then they showed a few other projects they have already managed to build at their young firm. 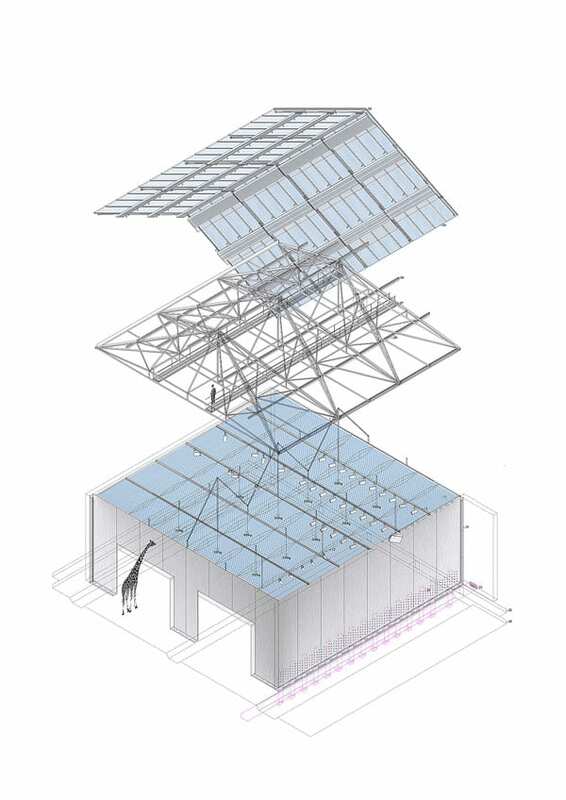 The couple met in Tokyo, where Kusunoki worked for Shigeru Ban after graduating from the Shibaura Institute of Technology there. 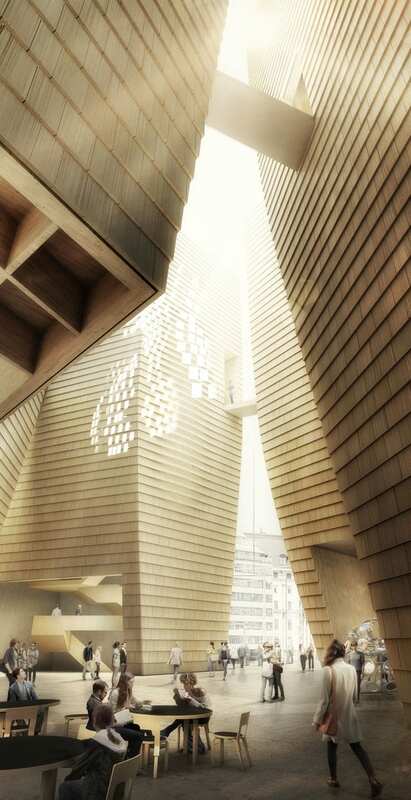 Moreau, who was educated at l’École Nationale d’Architecture de Belleville in Paris, started out at SANAA, where he worked on the New Museum in New York, then joined Kengo Kuma and Associates. 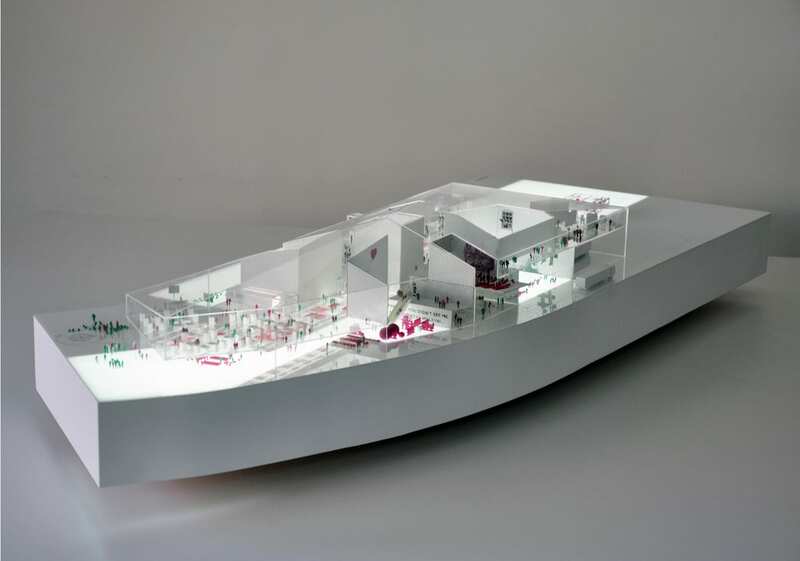 The two paired up to start a Parisian office for Kuma in 2008 and formed their own firm three years later. 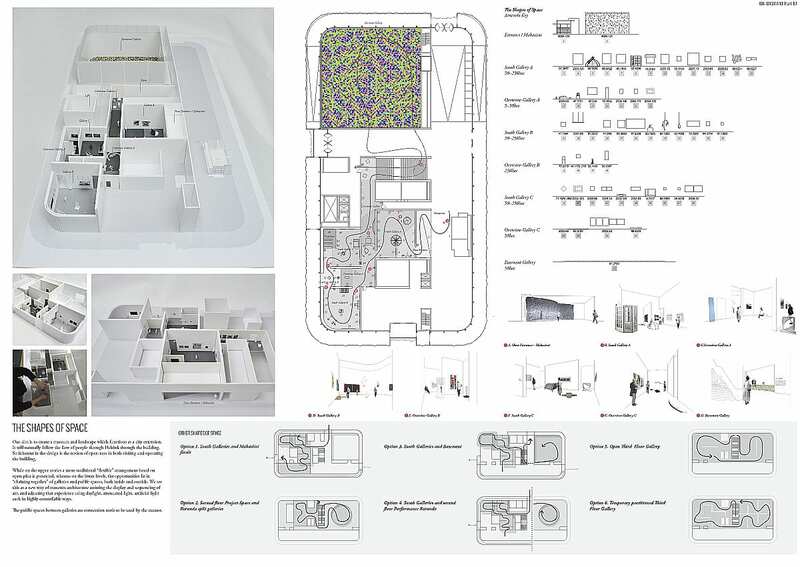 The brief introduction to the young firm’s work provided a helpful prelude to the presentation of their Guggenheim scheme. 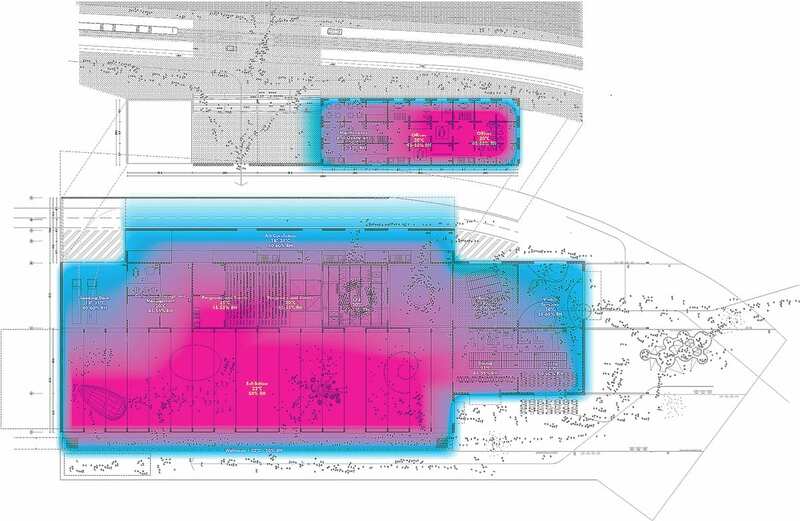 It, too, consists of separate structures linked by walkways and is sensitively related to its site. 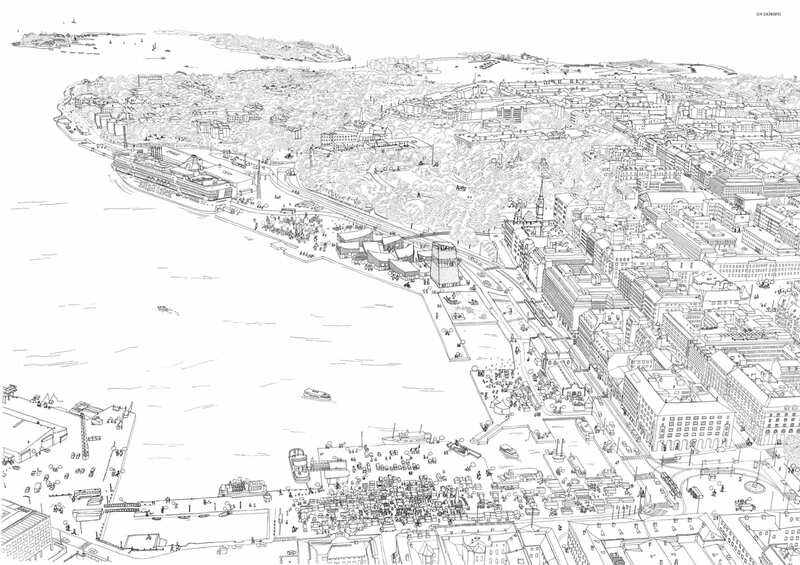 There is no better one in Helsinki, right on the harbor, the gateway to the city, visible from all around, and central to the city’s history. 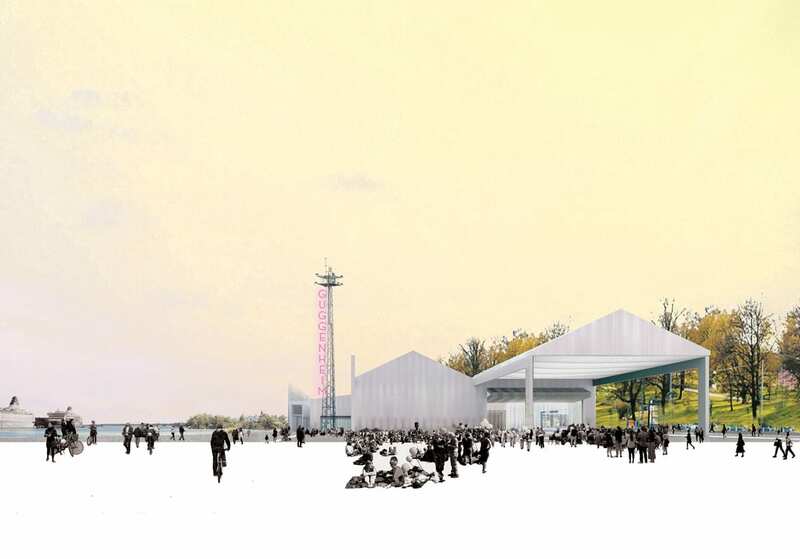 Moreau Kusunoki’s scheme, “Art in the City,” had been fine tuned several times since it was first developed, and it will no doubt be refined further if it is finally built. 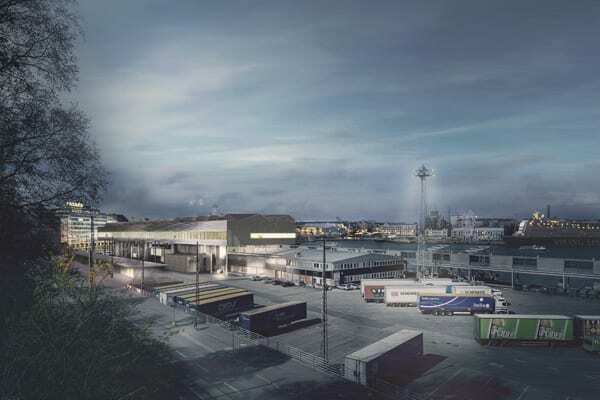 That is by no means certain, as the people of Helsinki are divided about the wisdom of building it, since the country is still in recession, and the Finns will have to pay for it. As several speakers noted, Finnish society is unusually open and democratic, so the project is openly debated. 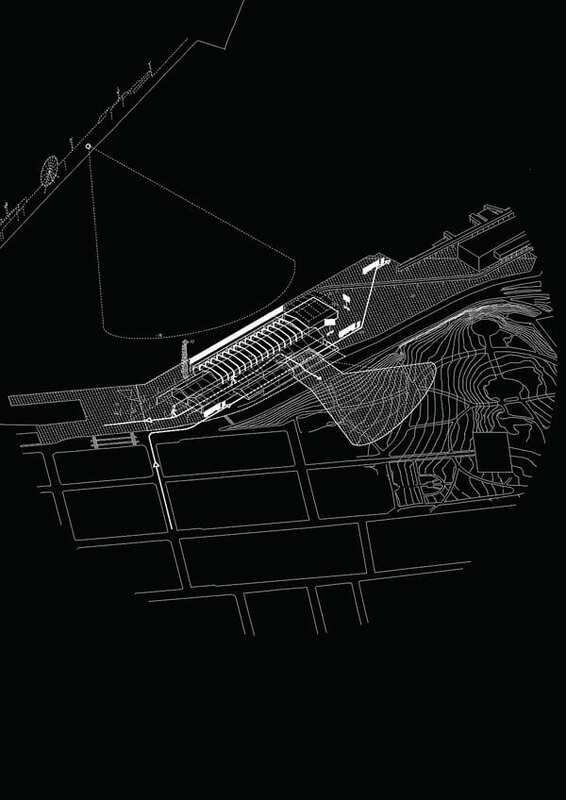 Projecting an elegant drawing, they explained that every pavilion in the scheme would be a little different. 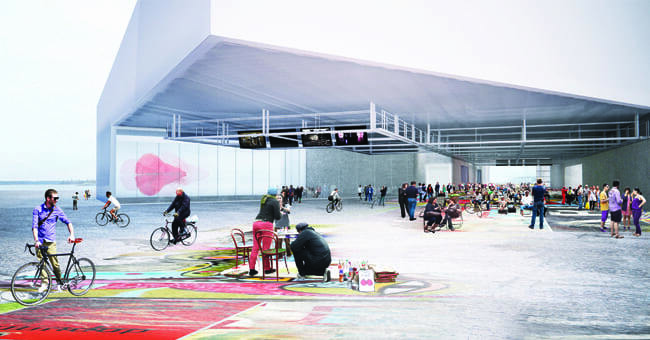 The challenge is to connect all the little plazas, make the spaces accessible to the public, and relate to the existing market—to create a new sense of place without destroying the old one. 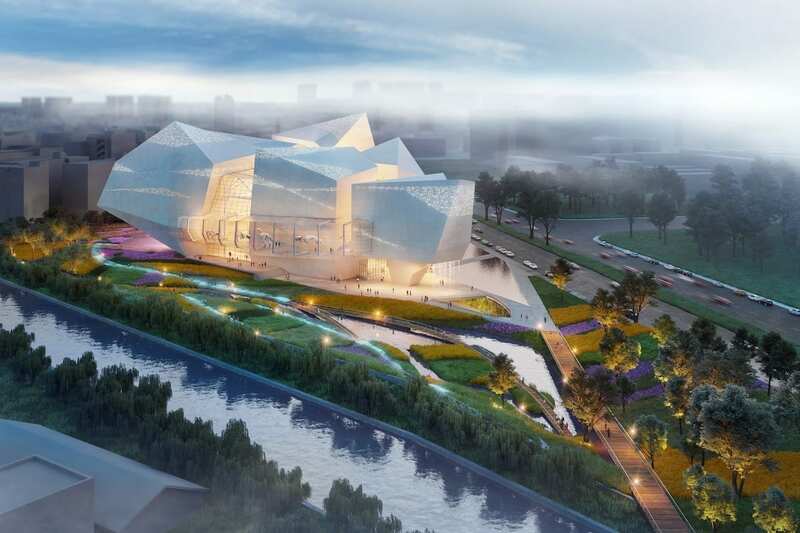 One building, the tower, will rise seven stories and have a major exhibition gallery on the ground floor with “a funny bridge,” two floors of offices, a kitchen, and a restaurant on the top. 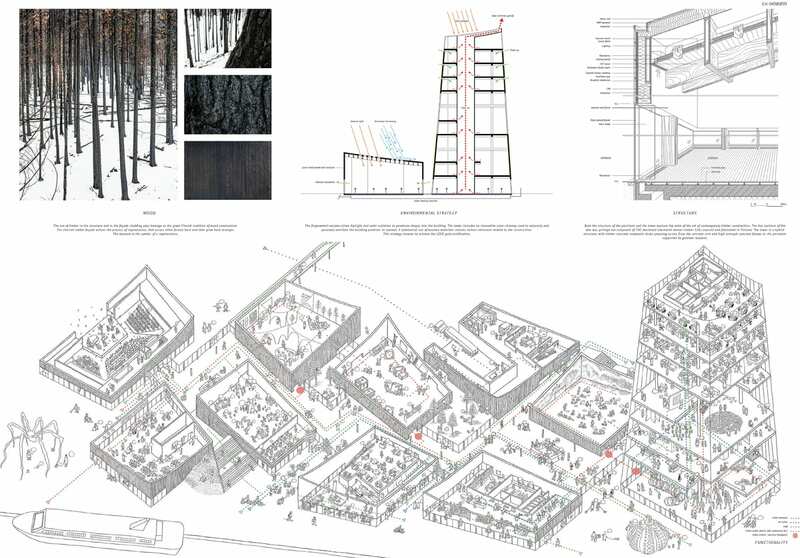 The entire complex is to be made of locally charred timber and glass, with a wood structure, since wood is a natural Finnish building material. 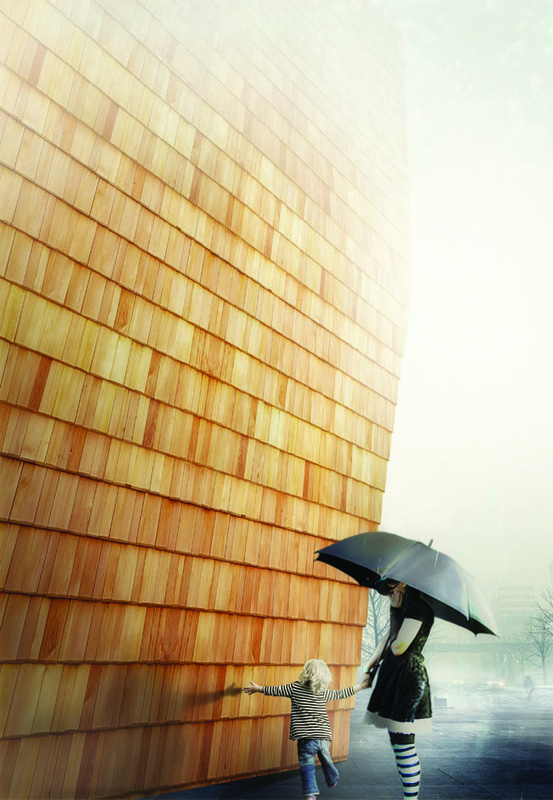 The wood will be treated with a blackened surface for both protection and appearance. 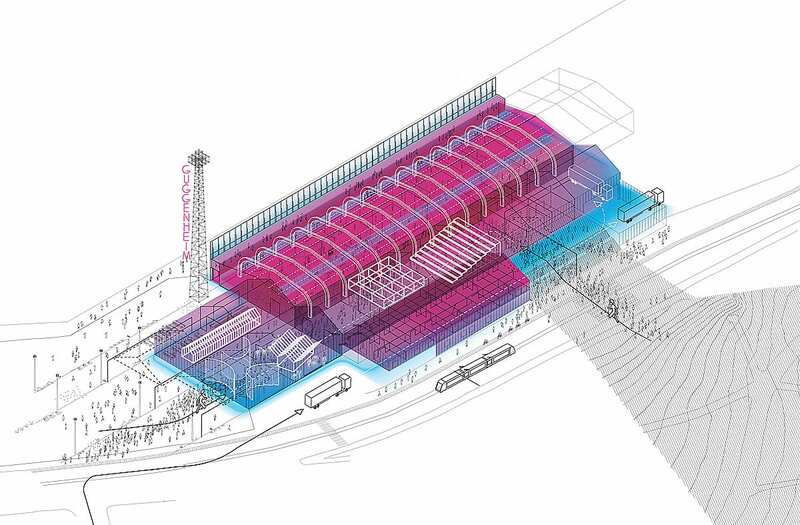 Spectacular drawings and axonometrics elucidated their presentation, showing both details and the urban context. Cathleen McGuigan, the editor of Architectural Record who moderated the panel discussion, began by saying, “I’m completely beguiled by the drawings.” She noted that Record did a survey of architects and learned that most found competitions an opportunity to explore ideas but disliked the fact that there was no compensation, except for the winners. 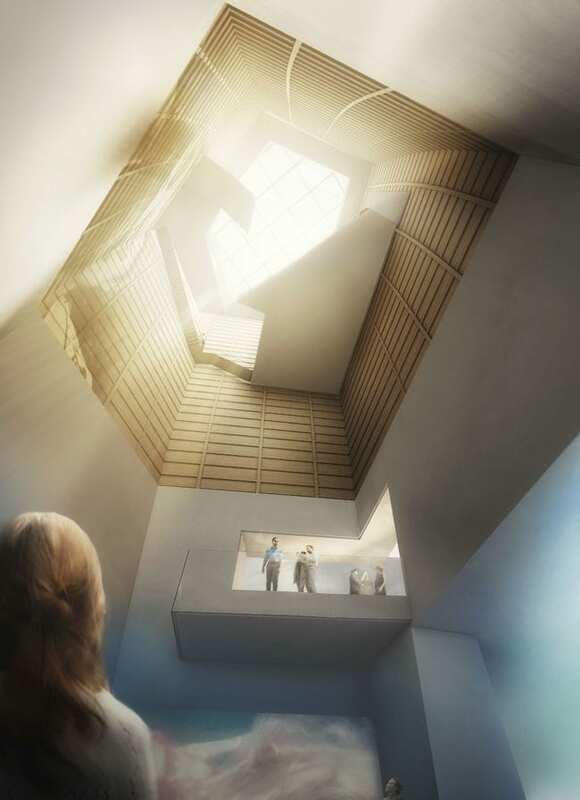 “Architects do like the exposure though,” she added. 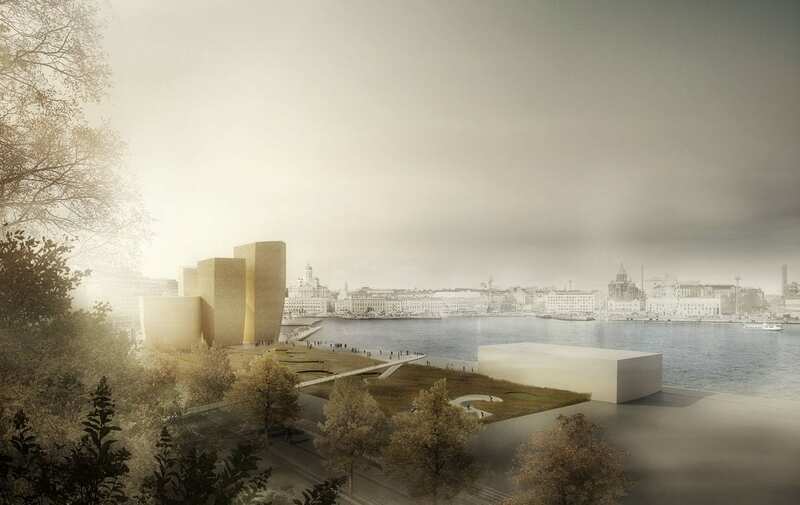 The Helsinki Guggenheim competition has offered unprecedented exposure. 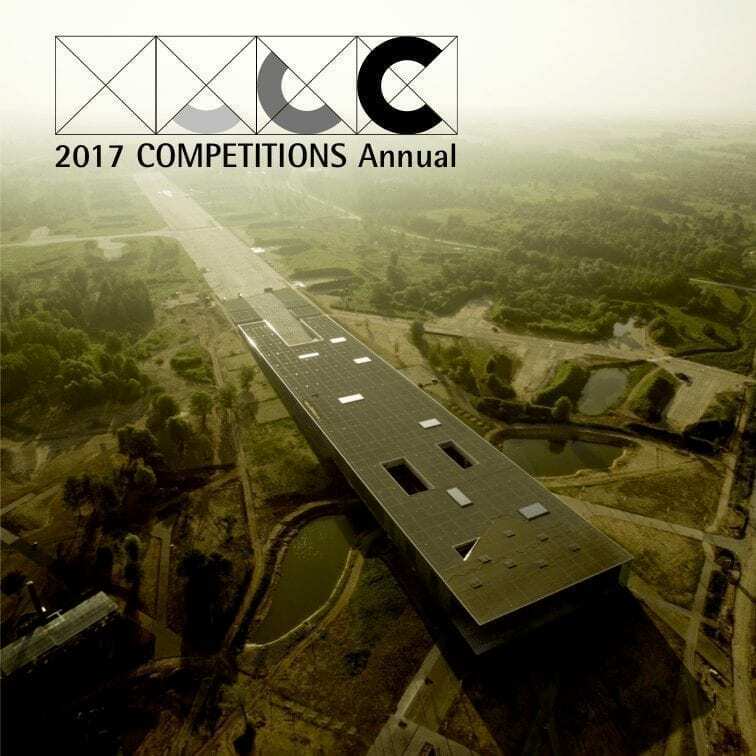 All the architects who entered—all 1715 from 77 countries—were invited to show their schemes on the web. The competition site had had four million visits by the time of the panel. “Blind competitions like this (open ones) are rare in the U.S.,” she noted. 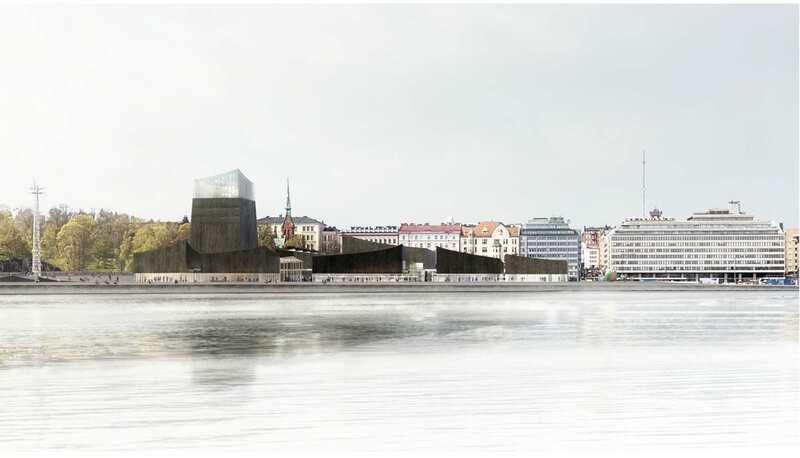 Then she asked the Guggenheim’s Ari Wiseman why the museum decided to partner with Helsinki. 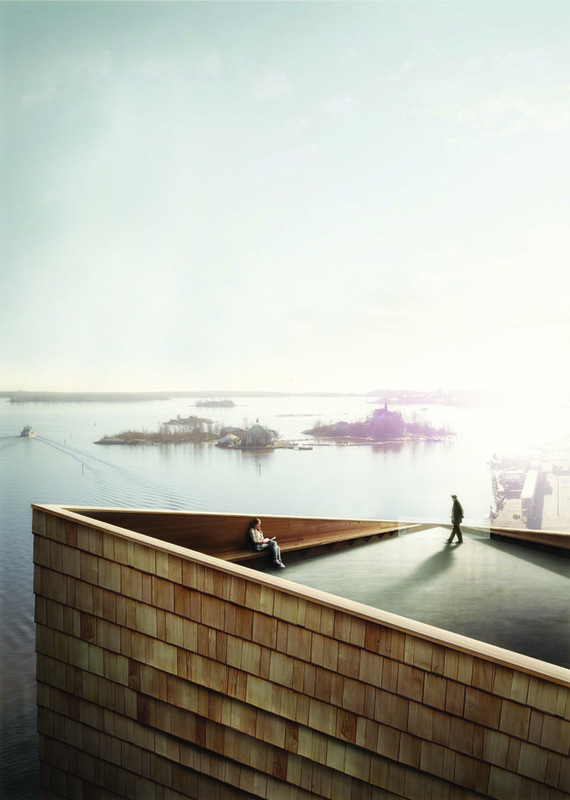 “The Guggenheim received an invitation from the Mayor of Helsinki in 2011. 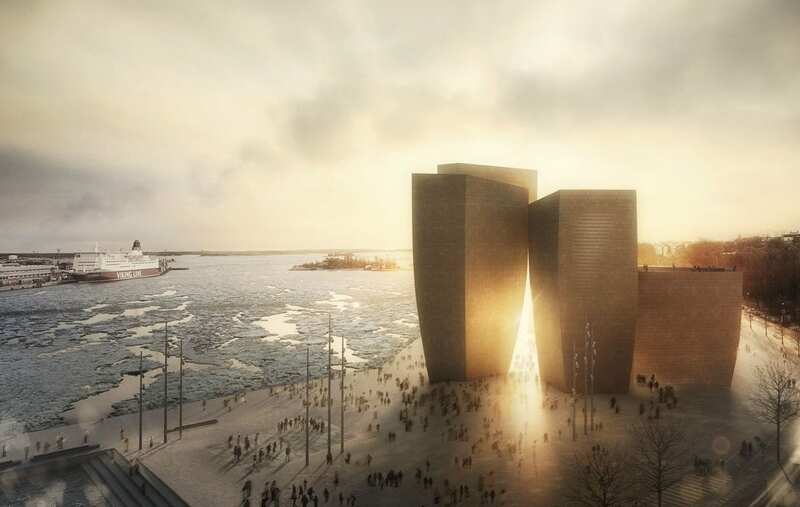 We’d had many such invitations before, but he was interested in thinking differently about museums—and in how a Guggenheim could relate to Finnish society,” Wiseman said. 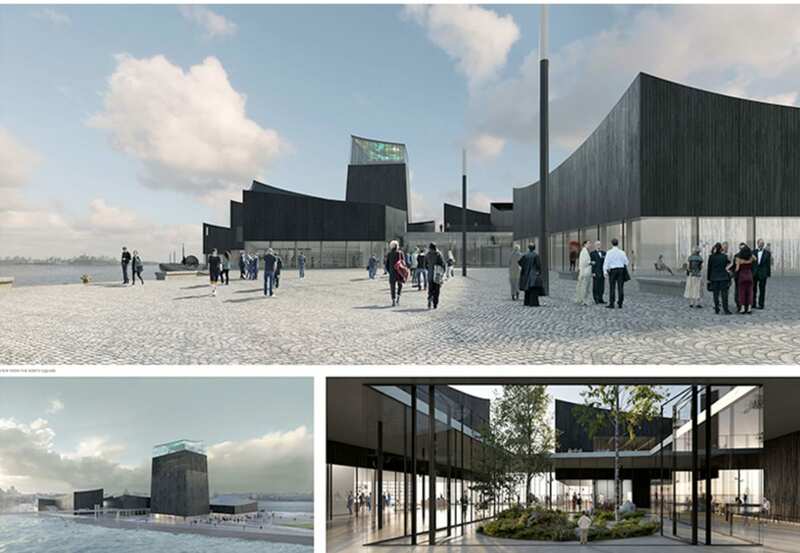 He noted that this was very different from Bilbao, which was “the first time we set out to develop a museum with the government of another place. 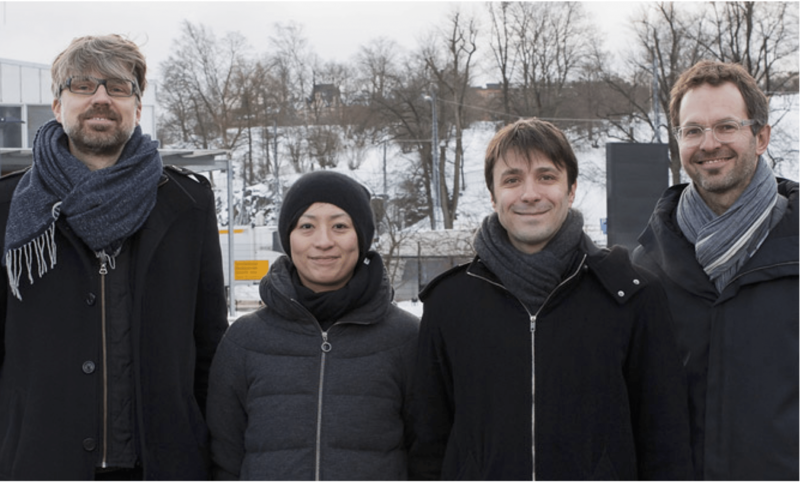 One difference here is that the program was entirely based on an exchange of ideas.” Over the years, the Guggenheim has had a lot of discussions with the people in Helsinki, where everything is very open. 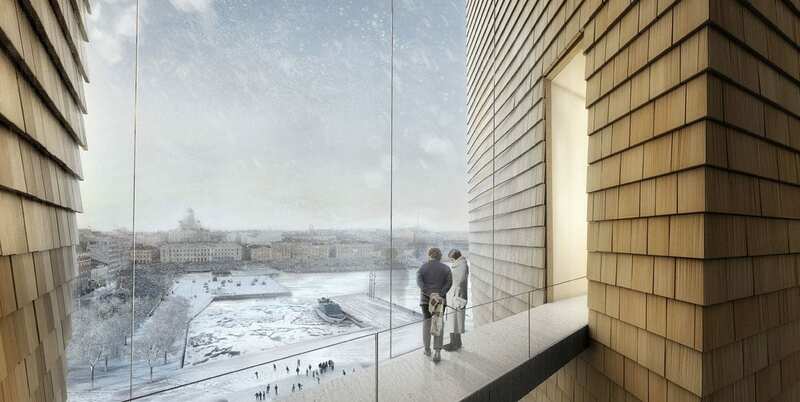 “Now that we have a building, there will be more to discuss,” not only in Finland, but on the web. 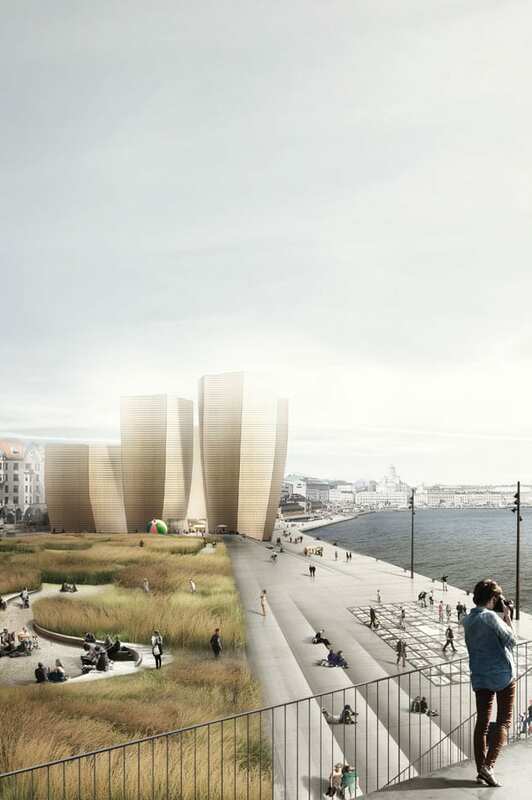 The scheme proposed a collection of linked pavilions, each orientated to respect the city grid, and anchored by a lookout tower. 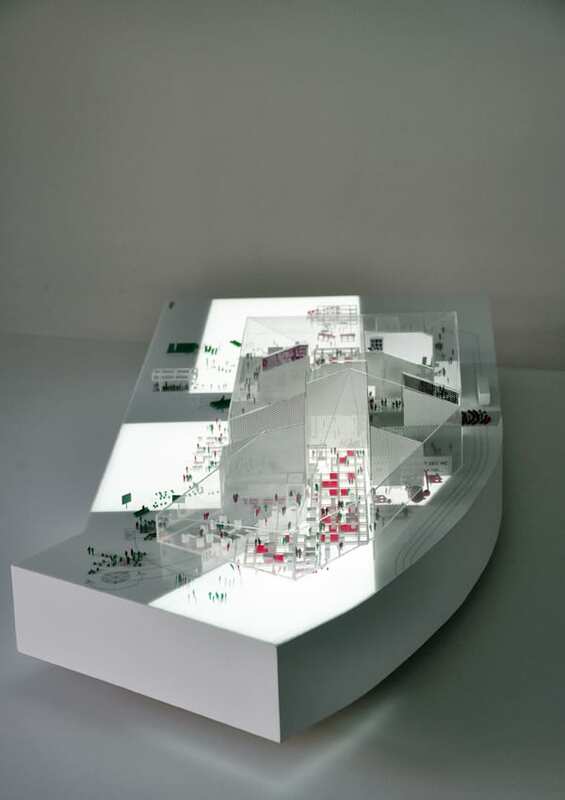 The building would cohere around a covered street landscape that expanded and contracted according to its interaction with the discrete pavilions and is animated by different activities. 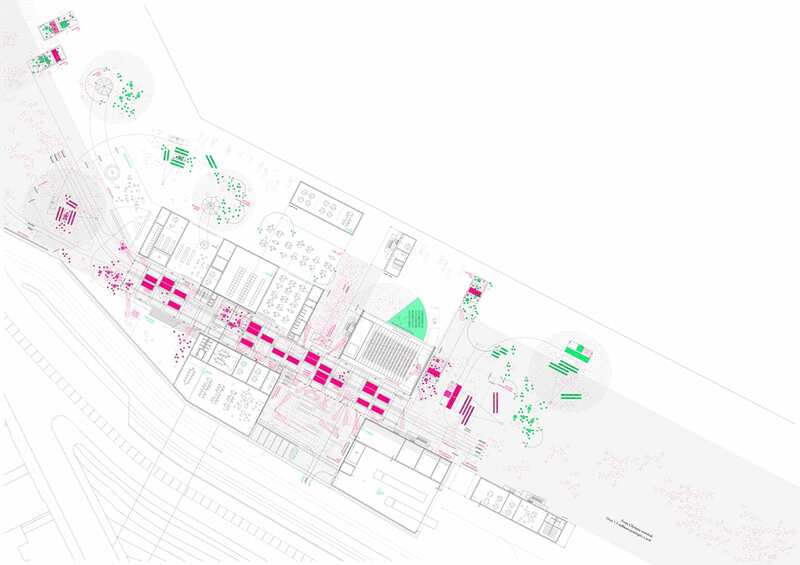 The Jury found the design deeply respectful of the site and setting, creating a fragmented, non-hierarchical, horizontal campus of linked pavilions where art and society could meet and inter-mingle. 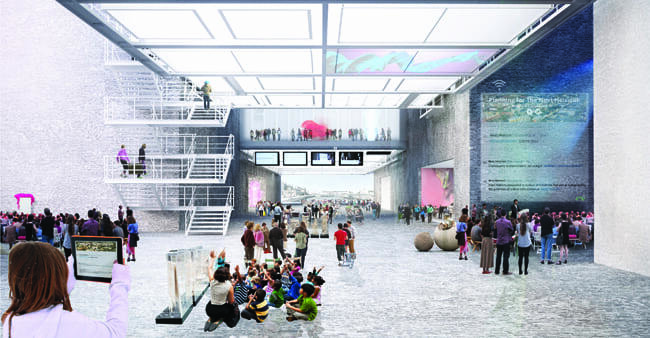 The connections between the pavilions have been well considered to permit a continuous gallery experience, if required. 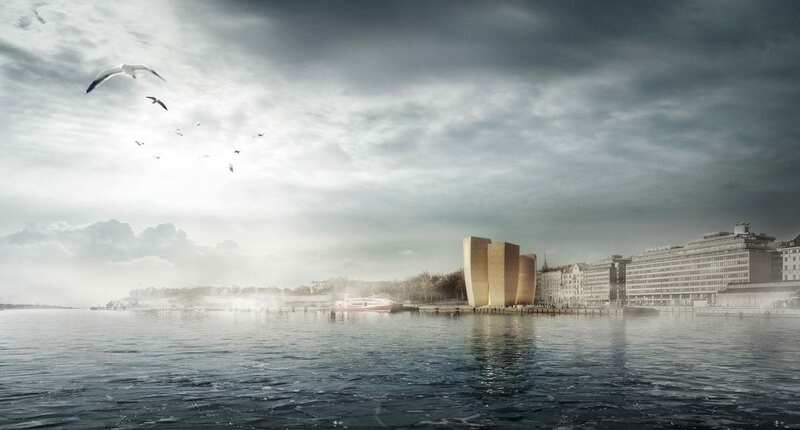 The waterfront, park and city each had a dialogue with the building yet the forms and materials were distinctive and contemporary, without being iconic. 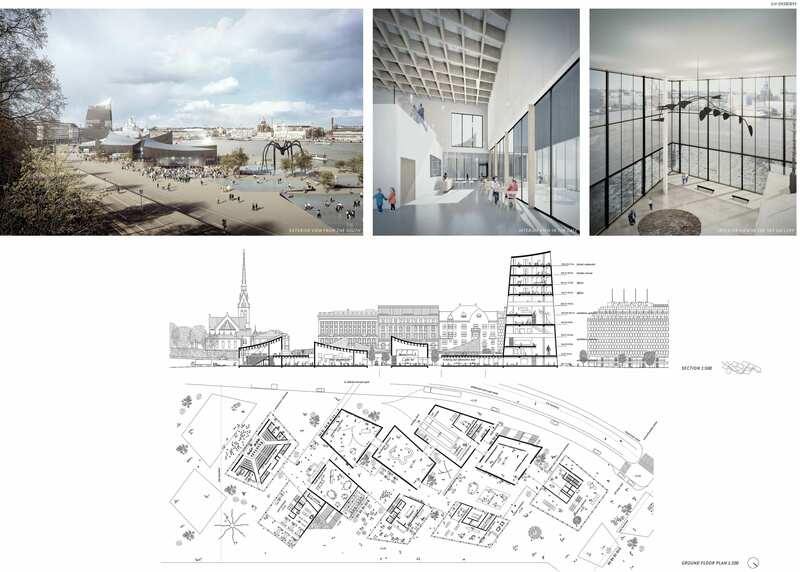 The drawings were imbued with a sense of community and animation that matched the ambitions of the brief to honour both the people of Finland and the creation of the museum of the future. 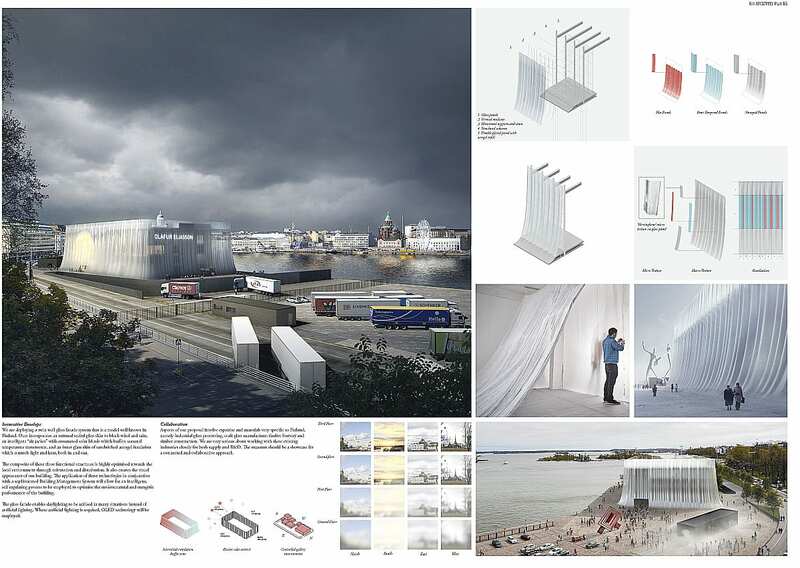 It was recognized that further work would be needed to resolve vertical circulation, use of the main terrace and the construction of the roof, but these issues were considered to be a normal part of design development and the Jury had confidence in the strength of the design concept. 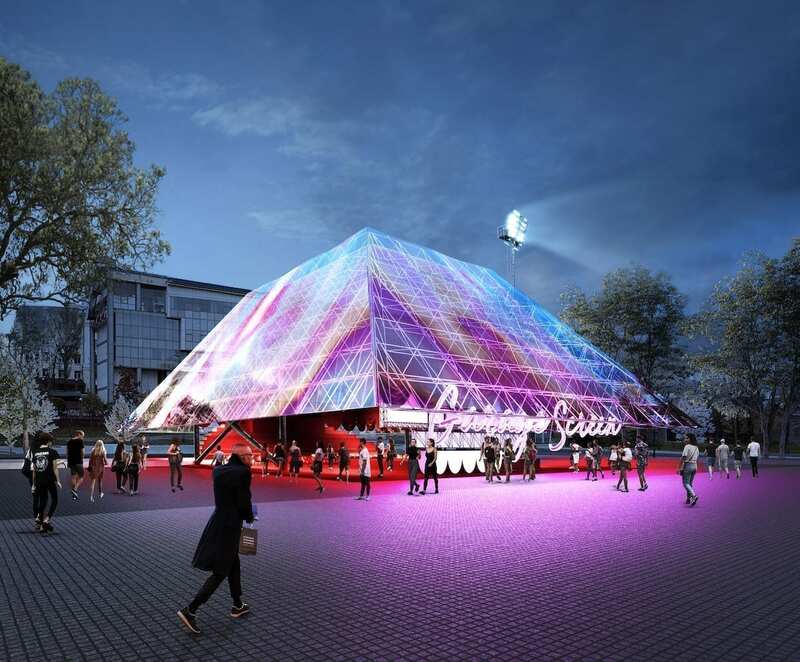 The concept is extremely flexible and is designed to embrace evolving urban, museum, and technological requirements. 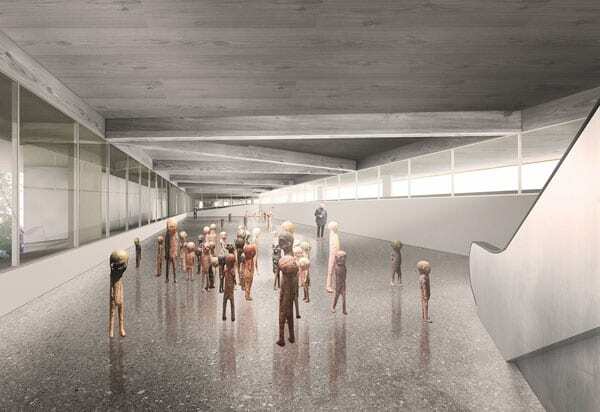 The Jury considered this scheme to be an elegant and strong concept, absorbing the existing terminal and creating a fascinating conversation between old and new. 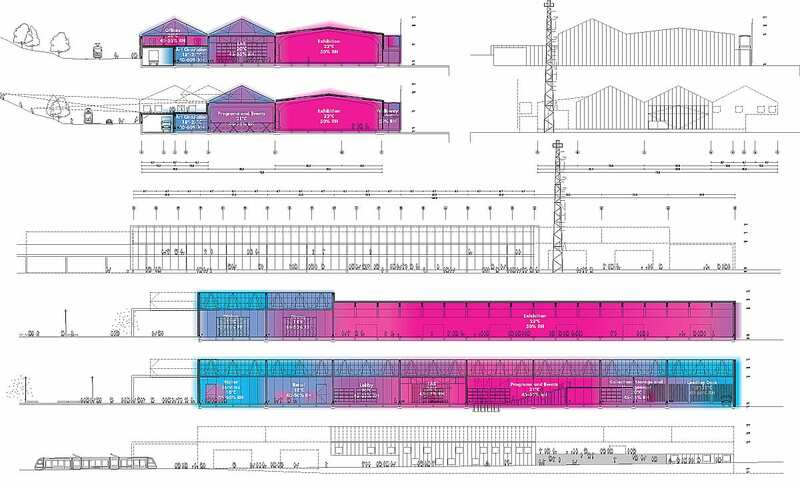 The form and orientation of the building picked up on the strong industrial/ harbor context. 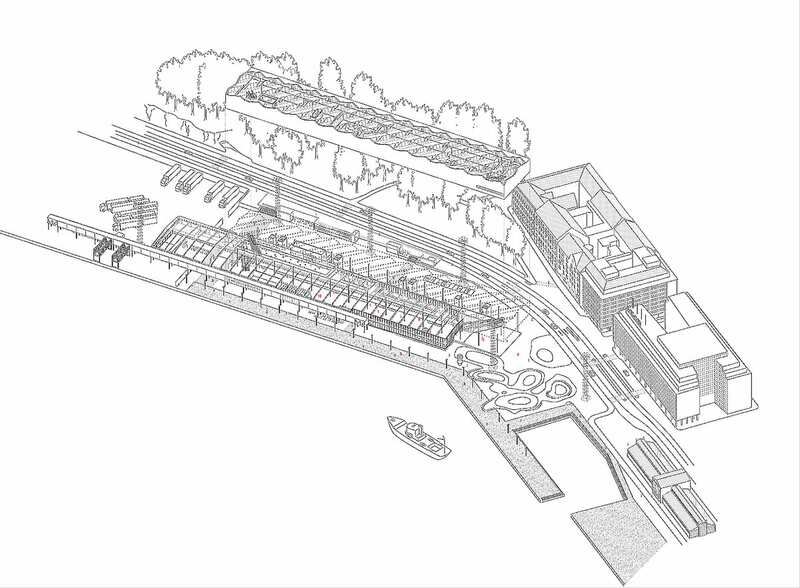 The homage to the industrial heritage of the South Harbor was applauded. 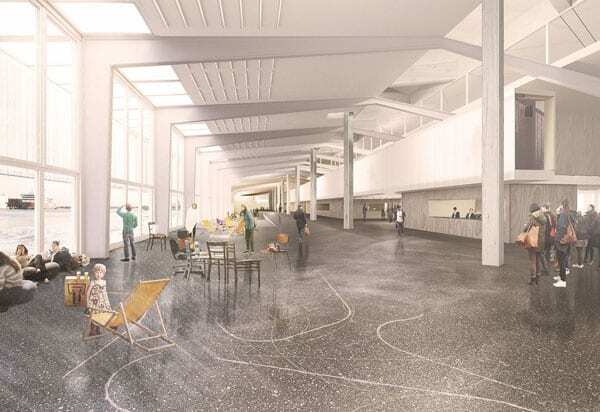 The Jury was positive about the concept of re-use of the original terminal building and the resultant architecture was well considered and polished. 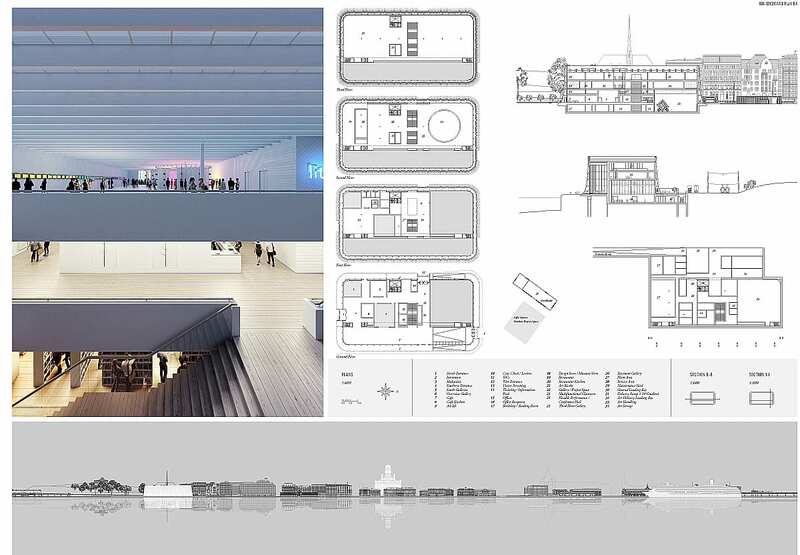 The scale of the building in the urban setting and its drawn-out horizontal form was striking and well balanced, although the connection between the reused terminal and the elevated gallery bar was not fully resolved. 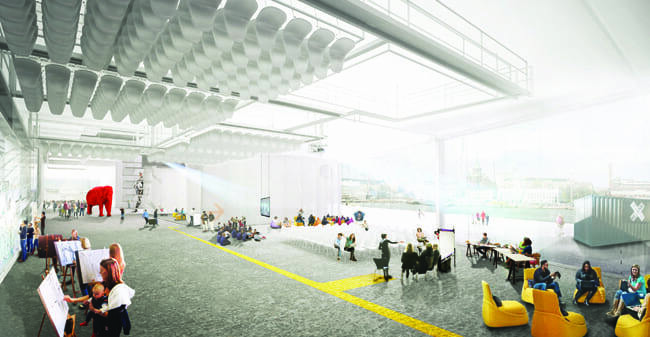 The interiors were generous, even if the renderings did not communicate the full potential of the respective spaces. 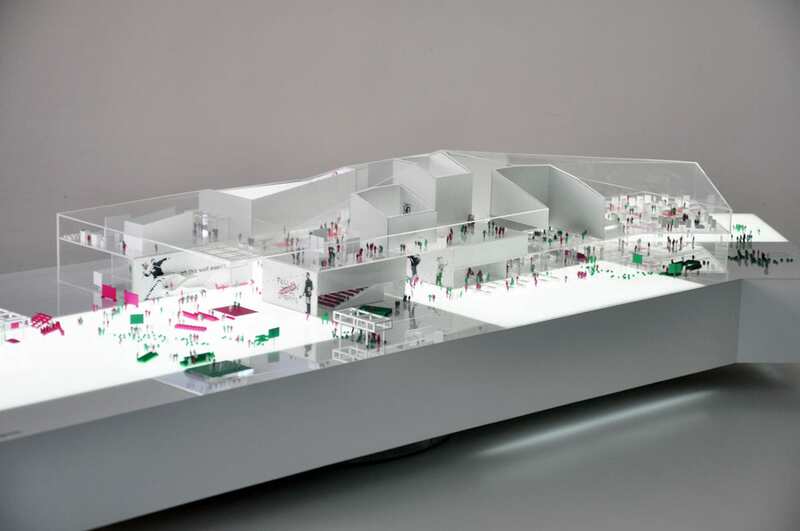 It was felt that the long upper open art hall offered a range of options but would ultimately inhibit curatorial programming, and that the lower reused terminal space needed to be much more dynamically organized. But there were agreeable social touches such as the long bar. 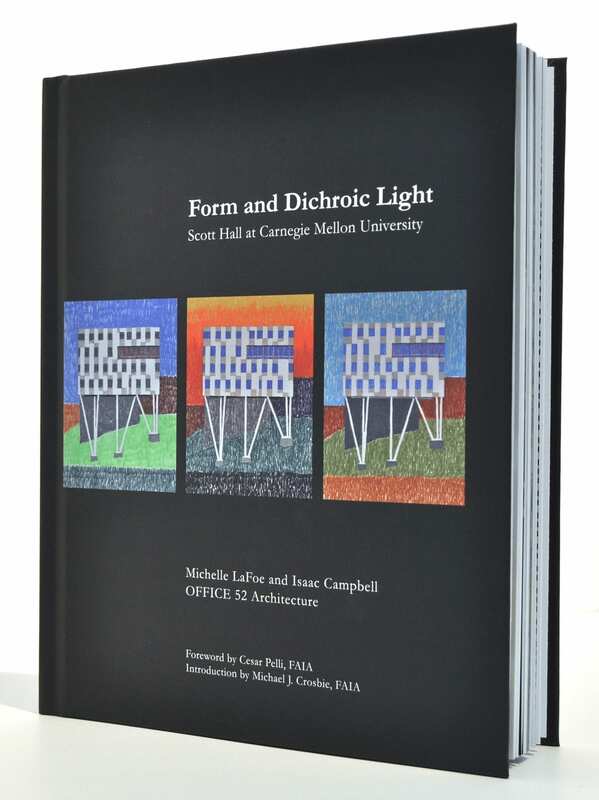 The Jury enjoyed the iconic representation of the building, which was beautifully rendered and presented. 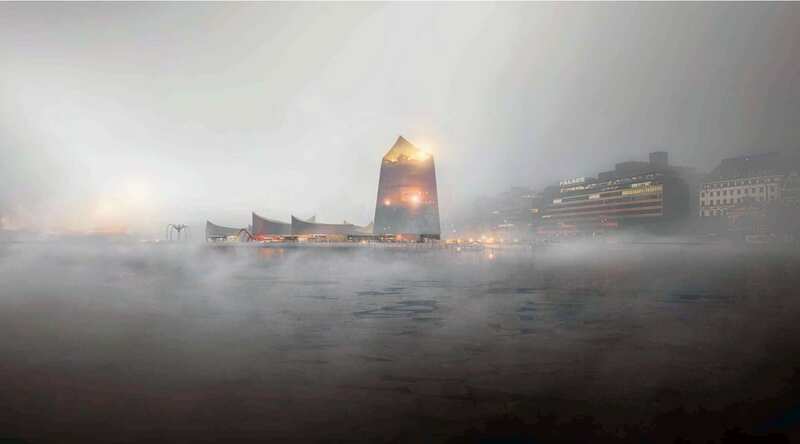 The identity of the slip-glazed form was unique and could be a fascinating addition to the waterfront. The technical analysis of structure and cladding were impressive and persuasive. The form of the building was skillful and had a strong character. 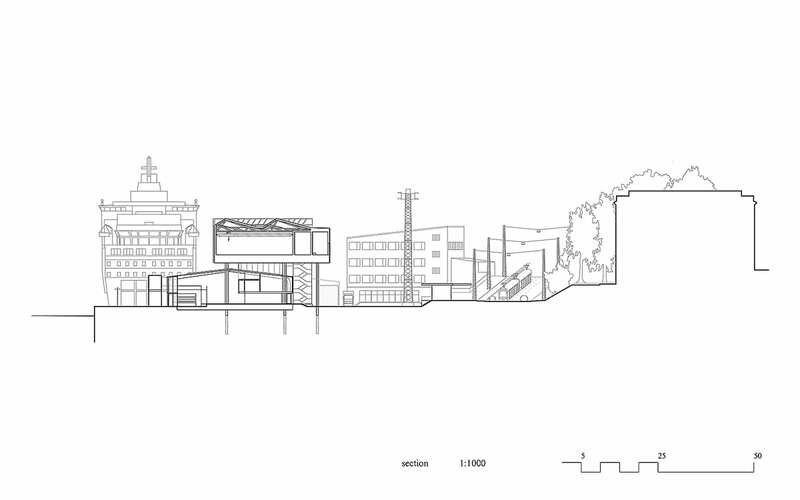 However, it was felt that the location of the building on the site and its relationship to the city were not convincing. 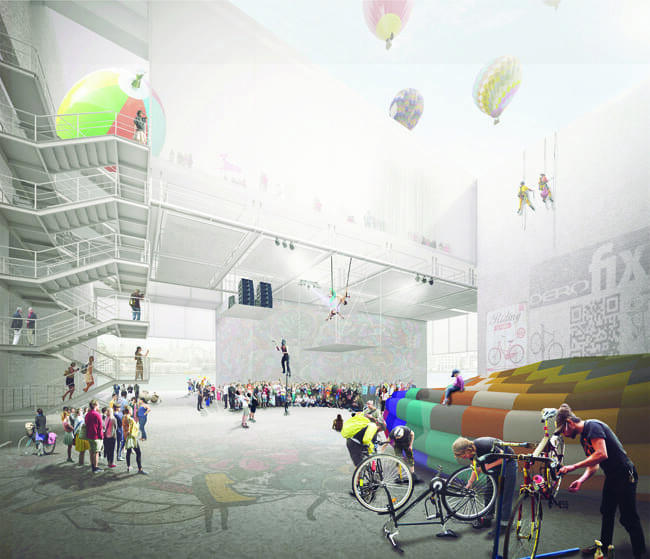 The roof’s unrealized potential as a public space and the positioning of the fence were perceived as shortcomings. 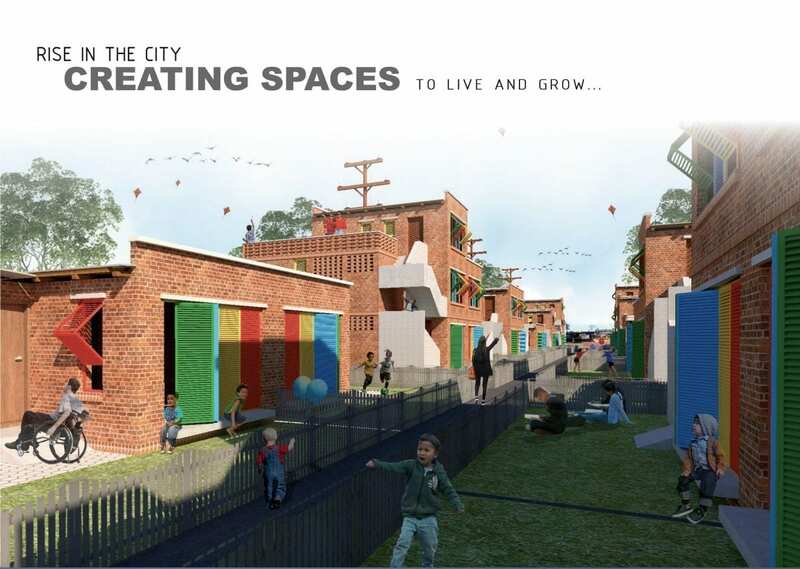 This led the Jury to question if the scheme had developed holistically since Stage One. The grand hall offered an interesting social potential. 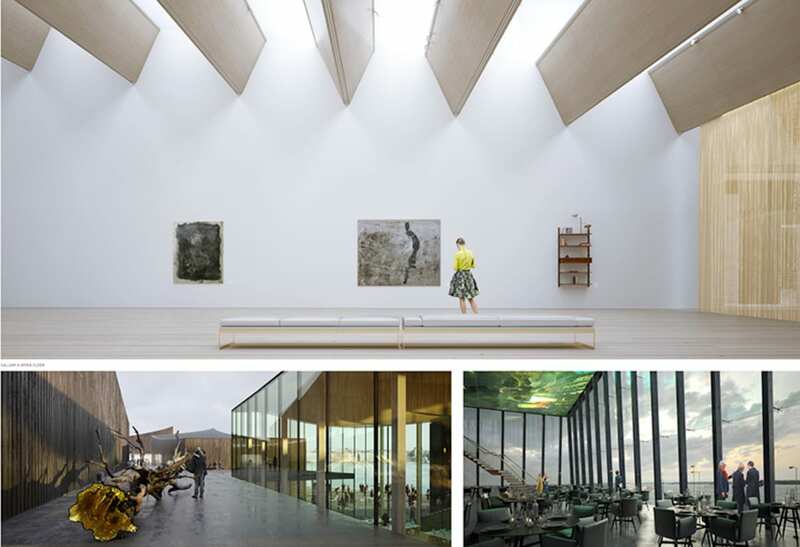 The Jury felt the scheme was full of promise but was lacking in sophistication internally, resulting in problems for art display and handling. 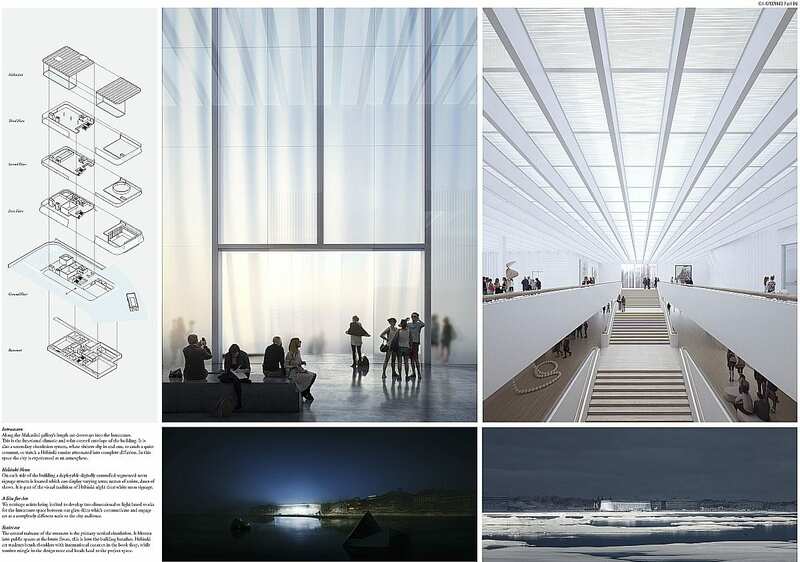 Conceptually, the building offered a fascinating commentary on climate and the role of the museum in exploring this. 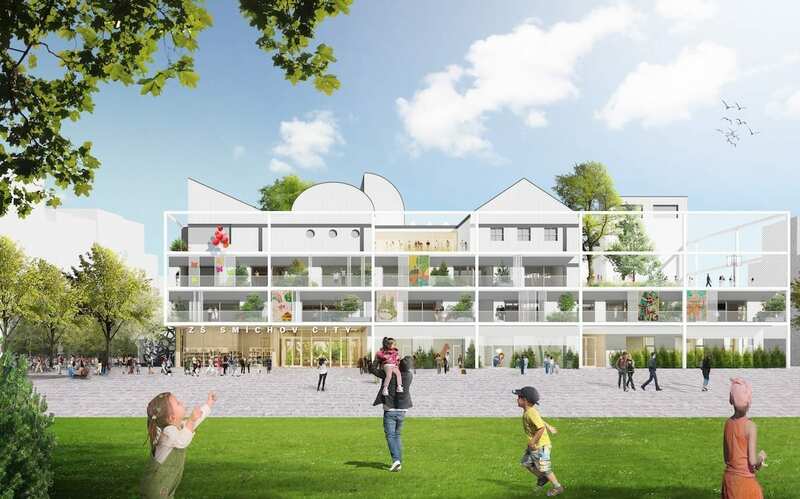 The careful re-use of the existing buildings on site and sensitive planning of new additions was well thought-out but lacked a convincing architectural articulation. Technically, the building structure and arrangement was well presented and the low-level, single story design was humane, responsible, flexible, and anti-monumental. Ultimately, however, it was felt that the strength and relevance of the proposition would not endure. 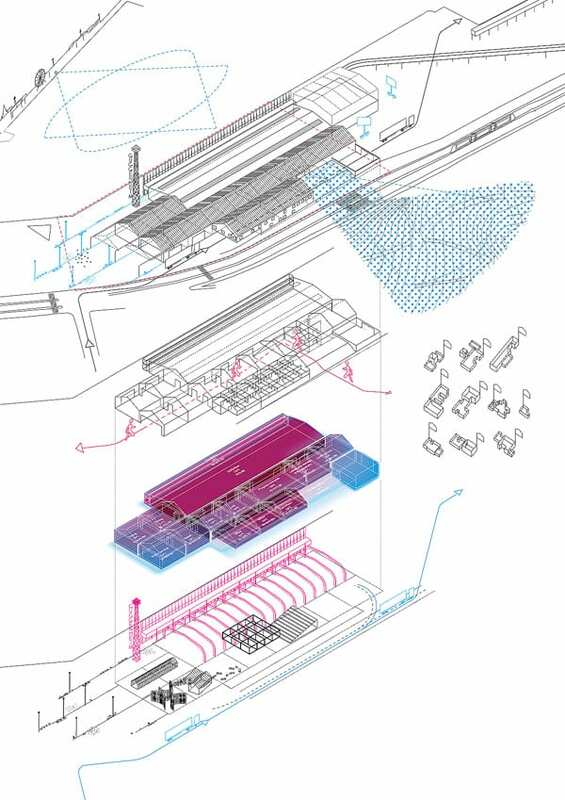 The narrow temperature range within the normal human comfort span would need to be explained rather than be experienced and other criteria would need to drive the organization and experience. 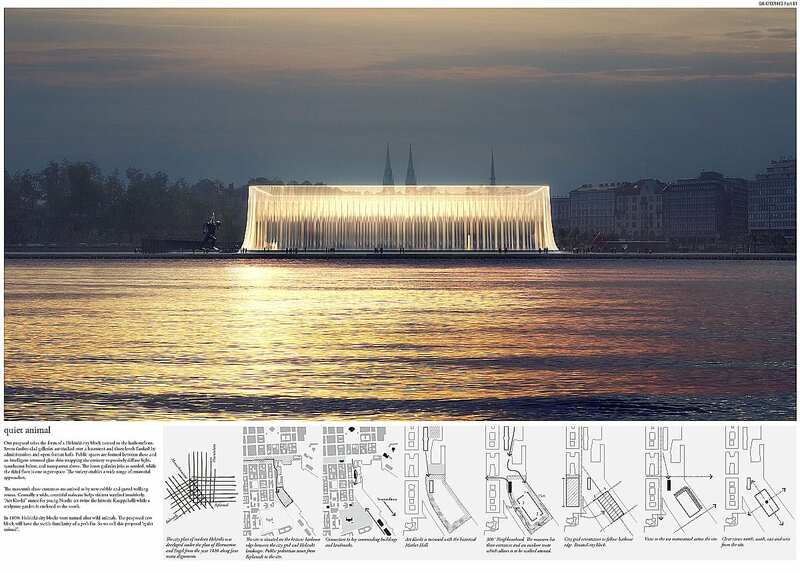 The Jury understood the building to be a landmark, architecturally-orientated museum with interesting notions about bringing green spaces to the water’s edge – a principle that was felt to be very relevant to the future of the city. 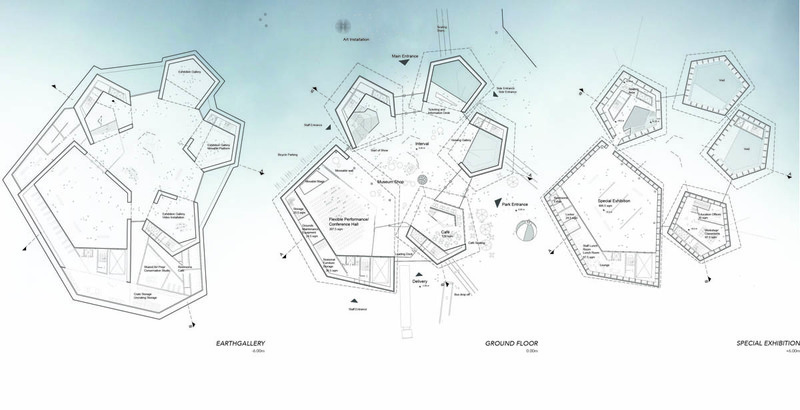 The inner courtyard could be a very memorable space. 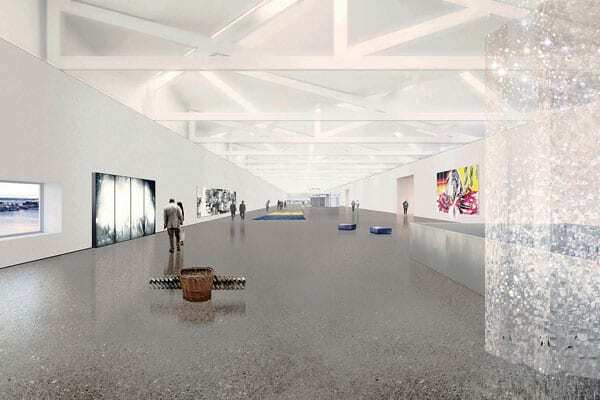 However, the scheme relied on convoluted internal circulation and a complicated arrangement of gallery space that would be a challenge to navigate and operate without offering substantially new opportunities for curating and encountering art. 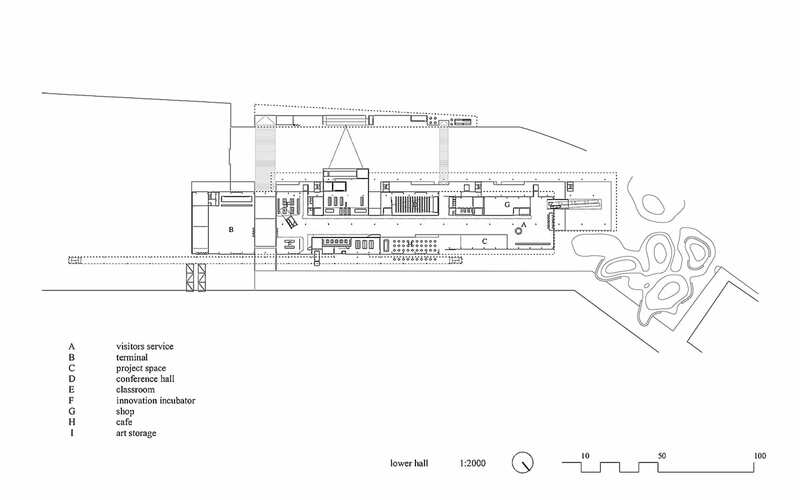 The external spaces were lively yet ultimately disconnected from the building. 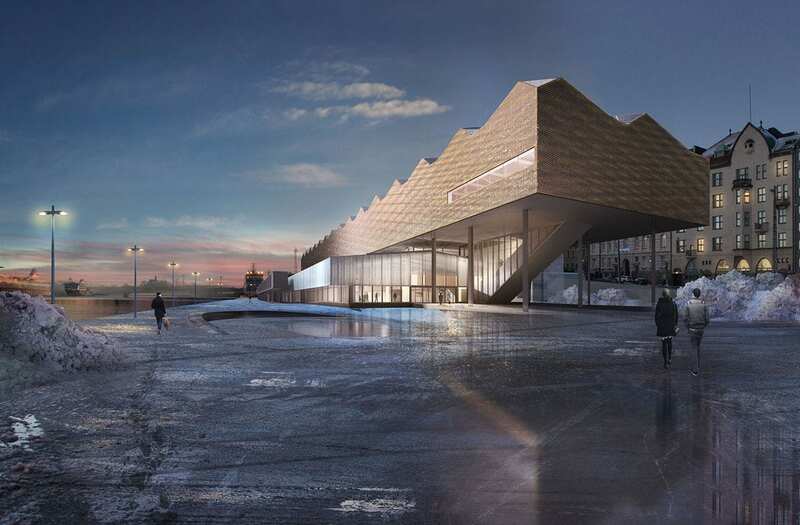 The wooden shingles were an exceptionally attractive part of the design, with local relevance, but the Jury questioned if the technical issues related to maintenance and replacement had been appropriately addressed. 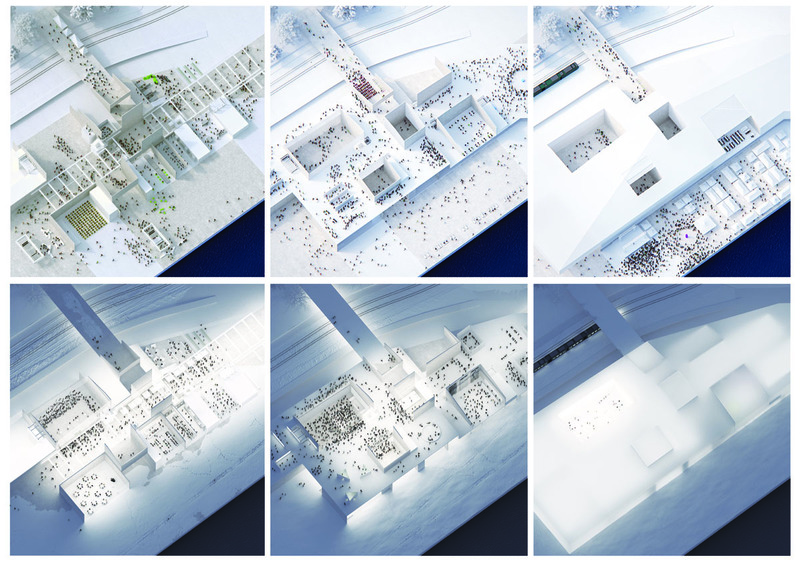 The Jury enjoyed the underlying architectural concept of the building as an engine of creativity – using the tension between street and gallery to create content and animate space. 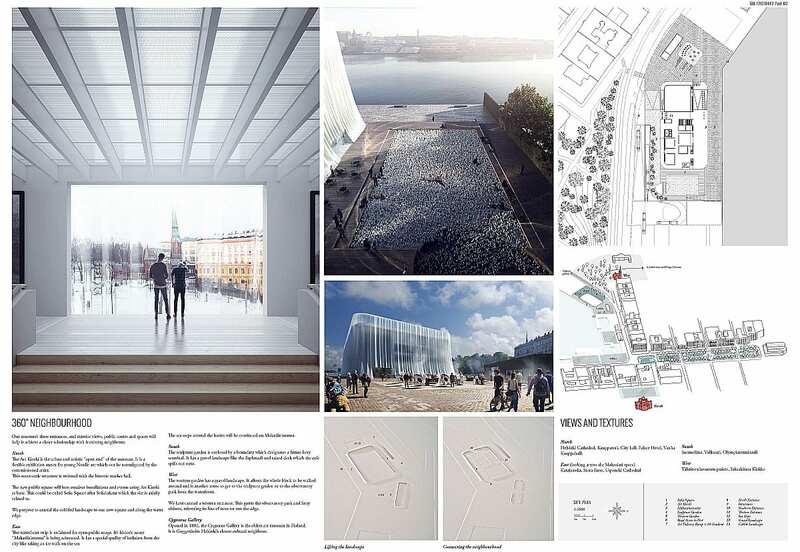 The glowing façade, animated street and programmed spaces could be spectacular, although there were strong concerns that this scheme would not have the outcome anticipated when the climate and social conditions in Helsinki had been taken into account (for much of the year the street would be inhospitable). 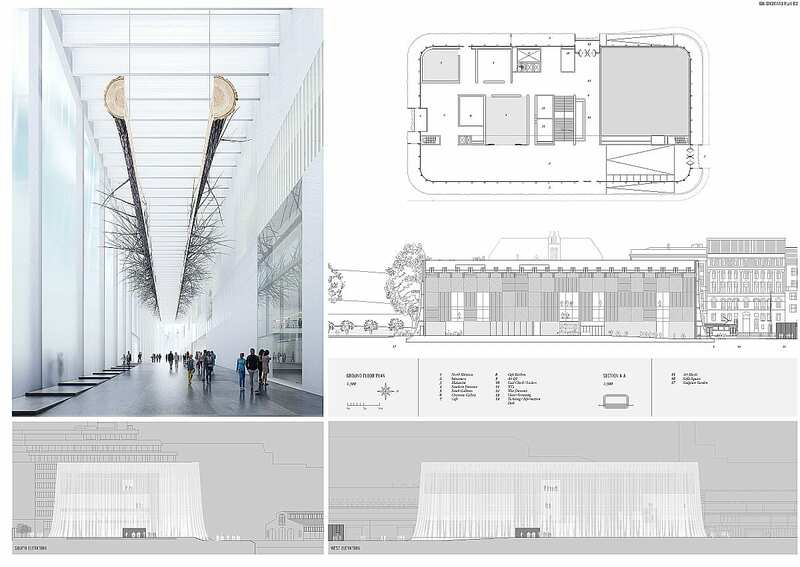 The elevated gallery landscapes and the interpenetration of the street and internal gallery spaces were highly appreciated. The presentation was lively and detailed (especially the models), but the design failed to develop resolutions for key functional and operational issues raised by the concept.